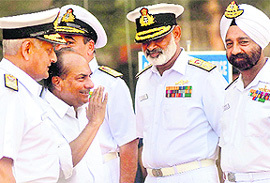 Declaring that the government has attached the highest priority to coastal security, Defence Minister AK Antony today asked the top brass of Navy to take immediate steps to ensure that proposals approved by the ministry were put in place at the earliest. Tropical cyclone Laila is unlikely to impact the progress of Southwest Monsoon, India Meteorological Department Director General Ajit Tyagi has said. Prime Minister Manmohan Singh has decided to play lone ranger when he addresses the press at the Vigyan Bhavan on Monday on the completion of the first anniversary of the second term of the UPA government. In a major catch, Ravi Shankaran, one of the main accused in the infamous Naval War Room leak case, has been arrested in London and the CBI has sought his early extradition. The BJP seems to have left its general secretary and former chief minister of Jharkhand Arjun Munda to his own devices and to fend for himself in his effort to displace chief minister Shibu Soren and occupy that chair. After a lull of a few months, the state government has renewed its effort to relocate a pair of big cats from the Ranthambore National Park to the Sariska Tiger Reserve. Four MPs of the Rajya Sabha have refuted the assertion by the Ministry of Youth Affairs and Sports that there was a full-fledged discussion on limiting the tenures of the office-bearers of the Indian Olympic Association and the National Sports Federations (NSFs) in the Upper House before the order was passed. Inflicting a heavy loss to the Railways and Indian Oil Corporation, the Naxals first caused derailment of a train carrying 14 tankers laden with High Speed Diesel and then set them afire, destroy the entire consignment on Thursday. The CBI, as part of its special drive to check adulteration of petroleum products and manufacturing of spurious drugs in the region, has taken 23 samples from various petrol stations in Punjab, Haryana, Himachal Pradesh and Jammu and Kashmir. The agency has booked a pharmaceutical company in Shimla, a petrol pump owner in Kumwara and in Lalru for pilferage of petroleum. The CBI has found evidence of “large scale and systemic” corruption in the Medical Council of India (MCI) and expanded the ambit of its probe that had so far been confined to a single case, which had been registered against MCI president Ketan Desai for accepting Rs 2 crore bribe from Punjab medical college officials. The Light Combat Helicopter (LCH) developed by HAL (Hindustan Aeronautics Limited) is all set to boost the chopper attack capabilities of the armed forces. In a major relief to LK Advani and 20 others in the Babri Masjid demolition case, the Allahabad High Court today rejected CBI's petition to revive criminal conspiracy charges against them. Taking a serious view of the huge gap between the financial returns of 3G spectrum auction as against 2G allocation held earlier, the CPM today demanded the ouster of Union Communications Minister A Raja, saying if he refuses to go, the Prime Minister should sack him in the interest of probity. An army man and his relative have been arrested in Kutch district by the Gujarat Anti Terrorist Squad (ATS) on charges of spying and passing on Army's confidential documents to Pakistan-based intelligence agencies, ATS officials said today. The Supreme Court today said granting approval to educational institutions that did not meet the required standards was like regularising illegal constructions. In a major challenge to former Chief Minister J Jayalalithaa, actor Khushboo, who had recently joined the ruling DMK, yesterday expressed a wish to contest against the AIADMK supremo in the Assembly elections due before May next year. In a rare show of unity, Tamil film directors, artistes, producers and technicians came together with an appeal to shift the venue of International Indian Film Academy (IIFA) award festival from Colombo. They also announced that Tamil film industry would boycott the show if the venue was not changed. India will observe Anti-Terrorism Day tomorrow to mark former Prime Minister Rajiv Gandhi's assassination on May 21, 1991. The Home Ministry said: "Anti-terrorism Day is observed to generate awareness among all sections about the danger of terrorism, violence and its dangerous effect on the people, the society and the country." Debates and discussions will be organised in schools, colleges and universities. Symposia, seminars and lectures will also take place. Some will use antique gramophones, others the colours of Bollywood or inspiration from the clean lines of a paper plane... designer cycle rickshaws could be plying at the Commonwealth Games village if things go according to plan. The Supreme Court today rejected a plea for urgent hearing of a petition filed by JVM chief Babulal Marandi seeking action against JMM chief Shibu Soren for misuse of a Constitutional provision to continue as Chief Minister of Jharkhand without becoming a member of the assembly. Addressing the Naval Commanders' Conference here, he said: “Coastal security is a very high priority for the UPA Government. Navy plays a key role in this with heavy and overall responsibility. The government has given a go-ahead to boost manpower and infrastructure of the Navy and the Coast Guard. It is now the responsibility of all of you to ensure that these are put in place at the earliest and used effectively and efficiently for coastal security”. He said the government was fully committed to the modernisation of the Navy and funds would not be allowed to become a constraint in this regard. However, the onus of utilising allocated funds, optimally and judiciously, lay collectively on both the Navy and the Defence and Finance ministries. Antony said his ministry was trying its best to suitably fine-tune the procurement process from time to time to bring in more transparency, efficiency and accountability. Annual review of the defence procurement procedure was one such step in the direction, he added. “We need to firmly secure our maritime frontiers, waterways and offshore resources on a permanent basis,” said the Defence Minister, adding that there was need to create necessary infrastructure for the security of Andaman and Nicobar Islands and Lakshadweep. “Our island territories form natural bulwarks that extend our strategic arms to our East and West and also function as the last outposts for the defence of our mainland. Considering the importance of the eastern region, we need to create the necessary infrastructure in Andaman and Nicobar islands. Similarly, Lakshadweep islands, which straddle the oil artery of the world, require our undivided attention,” Antony added. Monsoon rains have reached the Bay of Bengal and the Andaman Sea and are expected to hit Kerala by May 30. Notably, some weather experts had blamed Aila cyclone in May 2009 for the poor monsoon performance last season. Tyagi told The Tribune that while it was still too early to comment what effect would Laila have on the most-awaited weather phenomenon but in all likelihood the progress of monsoon would not be affected adversely by the cyclone. “The cyclone may lead to heavy rainfall in the eastern region, but as of now I do not see it impacting the progress of monsoon. However, these are atmospheric conditions and difficult to predict. The real picture will emerge only after the cyclone weakens. We will be able to study its effect after three to four days,” he said. The IMD chief said a cyclone of this nature could have positive as well as a negative effect on a weather phenomenon like the monsoon. Fortunately for India, the cyclone has occurred at the time when the monsoon system is yet to hit the mainland. Deadly tropical storms frequently generate in the Bay of Bengal during summer, creating havoc for life an property, leaving thousands of survivors with nothing. In April, a Nor’wester slammed Bihar and Bengal, killing over 100 persons. Last year’s cyclone Aila was West Bengal’s worst disaster in decades, killing 128. Some weather officials, who blamed Aila for poor performance by monsoon last year, are keeping their fingers crossed hoping that Laila does not repeat what Aila did to wind flows last year, taking away entire moisture feed to be wasted on the West Bengal coast. Last year, the monsoon system collapsed, leading to a 23 per cent deficiency in rains. The IMD said though the cyclone had weakened, the danger was not over yet as there were signs of it re-emerging in northern Bay of Bengal over the weekend. “After landfall in coastal Andhra Pradesh near Bapatla, the cyclone track shows that it will move along coastal Andhra and re-emerge in north Bay,” IMD Director General Ajit Tyagi told reporters in New Delhi. However, the move has not gone down well with many of his Cabinet colleagues who are upset at not being invited for the press meet. Senior ministers have been calling the Prime Minister’s Office (PMO) to enquire about the programme only to be told politely that they were not required to attend the press meet. Many of them had even altered their schedules to be present in the Capital for this occasion. The only exception is Information and Broadcasting Minister Ambika Soni, whose ministry is organising the press meet at Vigyan Bhavan. Even senior officials from the ministries have not been invited. “The whole idea is to allow the PM to interact with the media without the heavy presence of officials and ministers,” remarked a senior member of the UPA government. The PMO will be present in full strength. This includes Minister of state in the PMO Prithviraj Chavan, Principal Secretary TK Nair and NSA Shiv Shankar Menon. Congress’s media department chairman Janardan Dwivedi and spokespersons have got an invite. However, no official will be seated on the dias which will be occupied only by the Prime Minister. The Prime Minister is hosting a dinner at his Race Course Road residence on Saturday to celebrate the first anniversary of the UPA government. It will be attended by his ministerial colleagues, senior Congress leaders and UPA allies. A report card detailing the government’s achievements will be released on the occasion. Shankaran (46), a close kin of former Naval Chief Arun Prakash, was arrested by the Metropolitan police in London on April 21 and the CBI was informed about the same. “Shankaran has been arrested and we have moved for his early extradition,” CBI director Ashwini Kumar said today. He said Shankaran's arrest was a major breakthrough in the case and expressed hope that he would be extradited to India as soon as possible. CBI officials said once he was deported from the UK, he would be questioned at length about his involvement in the case. It is alleged that Shankaran had sent crucial classified information to commercial firms for pecuniary benefits. The CBI had registered a case on March 20, 2006, against former IAF Wing Commander Sambhaji Rao Surve, Shankaran, ex-naval Commanders Vinod Kumar Jha and Vinod Rana, Raj Rani Jaiswal, Mukesh Bajaj, Wing Commander (retired) S K Kohli, Kashyap Kumar and Kulbushan Parashar. Barring Jaiswal, Bajaj and Kashyap Kumar, chargesheets have been filed against all the others. The CBI has prepared documents for closing the case against the trio as nothing could be found against them. The CBI had earlier in 2006 sought arrest of Shankaran after he was spotted in Britain. However, he managed to give slip to the London police after a UK court issued an arrest warrant against him. Shankaran, who has been chargesheeted by the CBI in 2006, did not return to Britain after the arrest warrant for him was issued on April 10, 2007. Two days ago, on Tuesday, Munda held a press conference in Ranchi along with the chief minister and his son Hemant Soren where he announced that Shibu Soren would resign on May 25 and support him as the chief minister. But today Soren went back again on it and denied committing himself to any date. He declined to give a specific date for his resignation. “That could be BJP’s date, but not mine. When I have to resign, I will resign,” Soren told the media in Bokaro when asked whether he would quit on May 25, a date given by the BJP and the AJSU on May 18. On May 18, when the agreement had been reached between the two parties for sharing power on a rotational basis, Soren had not given a specific date for stepping down. The BJP, however, remained rather non-committal about the prospective government and even today BJP spokesperson Nirmala Sitaraman refused to make any commitment. Asked about the whole thing she said, “We will let you know when any decision will be taken.” Even on May 18 contrary to the assertion made in Ranchi Sitaraman remained non-committal, clearly indicating that the party has been rather skeptical of any success against Shibu Soren. Sources said realising the futility of pressurising Soren to quit, president Nitin Gadkari left it to Munda and went off to Europe on a holiday. According to Chief Wildlife Warden RN Mehrotra, two wildlife experts - Aparajita Dutta from the National Conservation Trust, who is also a member of the National Tiger Conservation Authority (NTCA) and Prof AJT John Singh, former professor of the Wildlife Trust of India - have already paid a visit to the Ranthambore National Park to identify a new pair of tiger and tigress for relocation. He said the experts had made the field visit between May 2 and May 6 and they will soon be submitting their report to the Union Ministry of Forest and Environment. “We are now awaiting a go ahead from the ministry,” he added. The experts had arrived from Bangalore on Chief Minister Ashok Gehlot’s initiative after four months of search for the pair selected earlier drew blank. According to Minister of State for Forest and Environment Ram Lal Jat, the previous pair had “strayed” out of core zone of the Ranthambore National Park. “The pugmarks have been seen in the area of Kali-Sindh River near Kota. However, difficult terrain has made it virtually impossible to nab them,” he said. A team of Wildlife Institute of India, Dehradun, had also extensively searched for the tigress T37 in March without any success. He said till now wildlife experts were keen on relocating the same tiger couple which has been untraceable since January, apprehending threat to their life. However, when there was no trace of them even after four months a fresh request was sent to the Centre for relocation of a new pair. Jat said once Dutta and Singh submit their report the relocation would be done swiftly. “We already have other requisite permission like use of helicopter and hence the relocation of new pair would not take much time.” Chief Minister Gehlot is said to have been keen to get this done in wake of the forthcoming Commonwealth Games as the state is hoping to draw a huge number of tourists, particularly to Sariska due to its proximity to New Delhi. Meanwhile, in another development, the NTCA has constituted committees to speed up the process of relocation of villages away from tiger reserves so as to create more space for the big cats. There are nearly 21 villages identified for relocation from the Ranthambore National Park and over 10 villages from the Sariska Tiger Reserve. The Ranthambore National Park currently has around 400 sq km core critical habitat for tigers and the idea is to expand it to over 1,100 sq km. "This is completely wrong", wrote the four MPs in a two-page letter to IOA secretary-general and member of the International Olympic Committee (IOC) Randhir Singh. The MPs who have signed the letter are Tarlochan Singh, Sukhdev Singh Dhindsa, India's chef-de-mission designate for the 2010 Commonwealth Games Bhubaneshwar Kalita and former Union Minister Birender Prasad Baishya. They pointed out that there was a discussion in the House on the budget demands of the Ministry of Youth Affairs and Sports on April 22, 2010. 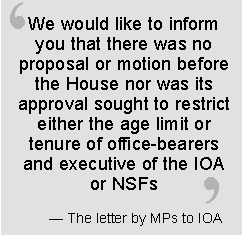 "We would like to inform you that there was no proposal or motion before the House, nor was its approval sought to restrict either the age limit or tenure of office-bearers and executive of the IOA or NSFs", the letter noted. The MPs said as many as 21 members of the House from various political parties took part in the discussion before Sports Minister Dr M.S.Gill responded, but "a majority of the members spoke against the controversies in IPL Cricket, including money laundering, and how cricket was impacting other sports, and only two members did mention that there may be some regulatory provisions for sports bodies". The letter clarified that "there was no mention against the IOA or any particular NSF. There was a strong plea that during the next five or six months, India's sole focus should be on the Commonwealth Games and there should be no diversion on any other issue. There was a strong plea that Dr Gill, Organising Committee chairman Suresh Klamdi and chef-de-mission Bhubaneswar Kalita should work together as a team to get maximum gold medals for India". The MPs said Dr Gill had made no mention of age limit or tenure of office-bearers of either the IOA or NSF. "In fact, he made no hint of the Ministry's plan to revive the 1975 guidelines. Ministry of Sports has wrongly informed the International Olympic Committee by stating that during the session, Parliamentarians from all parties urged some reasonable limit to the tenures of the office-bearers of the IOA and the NSFs. Nothing can be farther from the truth". Tarlochan Singh said the letter has been addressed to Randhir Singh to be forwarded to the IOC to clarify the true position of what had happened in the Upper House on April 22. The incident took place at around 1.50 am near Bangari halt on the Muzaffarpur-Narkatiaganj section of East Central Railway in East Champaran district of Bihar. The HSD was being transported to Raxaul depot of IOC on Indo-Nepal border from its Barauni refinery. The IOC supplies fuel to Nepal from its Raxaul depot. Although there was no loss of human life in the incident, the Railways suffered a loss of more than Rs 5 crore, said the Chief Public Relations Officer of ECR, Dilip Kumar. The Superintendent of Railway Police, Muzaffarpur Awadhesh Kumar Sharma said that the police suspected the outlawed Maoists to be involved in this incident as they had left some handbills on the spot. The drivers and the guard of the train told the police that the ultras using explosives blew up a portion of the track. Subsequently they set afire one of the tankers. The fire spread to other tankers destroying the entire consignment of HSD. The three fire tenders that could reach the spot proved futile to douse the flames. The firemen had to wait for about 12 hours for the entire fuel to burn out. The rail traffic on the section remained disrupted through out the day, with some trains being cancelled and others diverted. The DIG, CBI, Chandigarh zone, said the special drive was launched regarding the products affecting the life of the general public at large. In Srinagar, a surprise check at M/s GM Filling Station, Bumhama (Kupwara), was conducted. The raiding team took samples from the petrol station, which failed density and viscosity tests and were found to be adulterated. A case under the Essential Commodities Act and the Petroleum Act and Rules was registered against the petrol pump owner. Acting on information about pilferage of petrol from oil tankers, the CBI conducted check at Lalru in Mohali district along with the Mohali police. It was found that the illegally pilfered petroleum from the oil tanker was kept at a dhaba. The Mohali police has registered a case in this connection under the Essential Commodities Act. Similarly, the Shimla branch of the CBI raided the premises of M/s Jackson Pharmaceuticals Private Limited, Sansarpur Terrace, in Kangra following information that spurious medicines were being produced at the unit under the brand name “Comiflam” to make them resemble the product of popular brand “Combiflam”. During investigation, it was established M/s Jackson Pharmaceuticals produced the drug in October, 2009, when they did not had any valid licence for the same. The Drug and Licensing Authority, Himachal Pradesh, is also taking a follow-up action against the company. CBI director Ashwini Kumar said in a media briefing that the agency today registered a fresh FIR case against Desai and his family members for amassing wealth disproportionate to their known sources of income. He said they had unearthed assets worth Rs 24 crore in the name of Desai and his family, prompting them to register the FIR. However, what could be more significant is that the CBI is likely to register at least 4-5 more cases in coming days as its probe has dug up many incidents of the MCI granting favours to private medical institutions apparently in return of bribe. When asked if there was any evidence of the involvement of Health Ministry officials in the scam, Kumar said more MCI officials could come under their scanner. Desai, currently behind bars, is the only accused MCI official so far. Officials of several medical colleges could also be made accused in the FIRs to follow. CBI sources said many medical institutions were given permissions by the MCI for a host of things, from recognition to increasing seats and others, in lieu of money and other gratifications. The dimensions of Desai’s shenanigans were so far and wide that the probe agency went online, asking anybody with a complaint against the MCI to post it on its website. And the response has been more than encouraging with 154 complaints posted online by the likely aggrieved or informed people. The CBI would stop receiving online complaints after May 31 as it gets ready to probe those complaints which it would receive till that time. CBI sources said it was the scale of this massive corruption run by Desai and his cronies which prompted the Centre to bring an ordinance to dissolve the MCI and replace it with a six-member panel of experts headed by eminent gastroenterologist SK Sarin. Defence Minister AK Antony is coming to Bangalore on May 23 to formally dedicate the helicopter to the nation.“A full-fledged qualification test program would lead to initial operation clearance for induction of the LCH into the armed forces”, an HAL official said. He said IAF chief PV Naik and other senior functionaries of the Defence Ministry would also be present at the function at the HAL Airport here on Sunday. Asked how the LCH is different from its predecessor Dhruv, the official said, “The LCH is totally dedicated to attack. It also has a number of stealth features such as low oral signature and low visual signature”, he said. The official said an armed version of the tandem seating helicopter would be flown before the Defence Minister. The maiden flight of the LCH prototype (the same machine will fly on Sunday) took place at HAL’s helicopter complex in Bangalore on March 29. The flight lasted for 20 minutes and provided the pilots an opportunity to carry out low speed, low altitude checks on the various systems on-board the LCH. The HAL had announced its plans to build an attack helicopter in 2006. Funds for the design and development of the LCH to meet the requirements of the Army and IAF were sanctioned in October 2006. The new helicopter is a derivative of the HAL Dhruv helicopter, which has already been inducted into the armed forces. Using the base platform of Dhruv, an Advanced Light Helicopter (ALH), helped the HAL minimise the costs of the development of the LCH project. Besides stealth features, the LCH also has crash landing gear as a safety measure. However, the case against them for inflammatory and provocative speeches will continue at Rae Bareli. In his 44-page judgement, Justice Alok Kumar Singh of the Lucknow Bench of the high court said there was no merit in CBI's revision petition challenging the May 4, 2001, order of the special court which directed dropping of criminal conspiracy charge against BJP leaders Advani and Murli Manohar Joshi, besides Uma Bharti, former UP Chief Minister Kalyan Singh and others. There are two sets of cases - one against Advani and others who were on the dias at Ram Katha Kunj in Ayodhya on December 6, 1992, when Babri Masjid was demolished and the other was against lakhs of unknown kar sevaks who were in and around the disputed structure. The judge noted that the CBI had filed supplementary chargesheet in May 2003 against Advani and seven other leaders. The trial in this case is proceeding in Rae Bareli. In a Politburo statement today, the Left party said the outcome of 3G spectrum auction yesterday convincingly proves that Union Communication Minister A. Raja was involved in corrupt practices by selling 2G spectrum to some industrialists by manipulating TRAI recommendations. The party was referring to the fact that whereas 3G spectrum fetched Rs 70,000 crore, 2G spectrum was sold at a paltry Rs 2000 crore. “Raja did so by blatantly violating the law causing a huge loss to the public exchequer,” the CPM said adding that despite repeated demands made in Parliament and outside, the minister has nonchalantly continued to stick to his position. Such a situation can’t be allowed, said the party Politburo, demanding Raja’s immediate resignation pending a high-power enquiry into the entire 2G spectrum scam. “If the minister refuses to resign, the Prime Minister should sack him to maintain the dignity of the high position,” the CPM said. Ibrahim Sama, recruited through the Military Engineering Service (MES), and his maternal uncle Osmaan Sama were arrested yesterday from Bhuj in Kutch on charges of spying and criminal conspiracy to disturb internal security, they said. Confidential and sensitive documents of the Army and some phone numbers of their Pakistani contacts, were recovered during searches conducted in the duo's houses, the officials said. Both were produced before a local court in Bhuj, which sent them to nine-day police custody for further interrogation, they added. The officials said the ATS had received a tip-off that Sama used to get secret and confidential documents from the Army as he had an access to its base in Bhuj. He used to send the confidential documents to his uncle Osmaan of Nana Dinara village in Bhuj, with the objective to pass it on to Pakistani intelligence agencies, they said. “Compromising on educational standards was like allowing illegal constructions and this trend had given rise to the feeling that education has become commerce,” a vacation Bench comprising Justices GS Singhvi and CK Prasad said while referring to a regular Bench a bunch of applications by private Ayurvedic colleges that have sought permission for taking students for the current academic season. “You say they have filed false affidavits. Then why did you grant them approval,” the Bench questioned the counsel appearing for the Central Council of Indian Medicine. The council had refused approval to the same colleges for the previous years contending that they did not fulfill the necessary standards. Almost 95 per cent of the 465 such colleges in Maharashtra lacked basic infrastructure facilities, the apex court noted. At an earlier hearing, the Bench had vent out its ire, observing that in this country all types of irregularities were regularised, murder convicts were pardoned, irregular appointments were made regular and illegal constructions regularised. 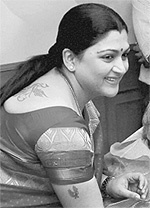 Kushboo's bold assertion comes despite Tamil Nadu Chief Minister and DMK supremo M Karunanidhi's assertion that the ruling party was not contemplating fielding the new entrant against the AIADMK leader. Reacting angrily to the action of Jaya TV, the AIADMK channel, which cancelled a popular programme called "Jackpot" anchored by Kushboo, immediately after she joined the DMK, actress Khushboo said, "Jayalalithaa had never been friendly to me. She did not talk to me much even when I met her." “The TV programme Jackpot that I was doing for Jaya TV was very popular and was appreciated by people. Jayalalithaa never talked to me about the programme even once,” she complained. If the DMK gave me ticket to contest Jayalalithaa, I would contest against her, Khushboo challenged and added that she had never been close to Jayalalithaa. Khushboo asserted that actors were very much aware of what was going on in the country and added that only courage and maturity was required for entering politics. She also lauded the DMK for giving freedom to everyone to air their views and said she joined the DMK, since it was a party which respected individual liberty. Before joining the DMK, Khushboo had said she had friends in the DMK and AIADMK as well as the Congress and she could join any of the three parties. Even after joining the DMK, she asserted that she would continue to anchor the "Jackpot" programme in Jaya TV, since acting was only her profession. But, the programme was cancelled by the Jaya TV management immediately after she joined the DMK. Accusing the “Sinhalese government” of trying to “divert the attention of international community from the genocidal war in which thousands of Tamil children, women and elders were brutally killed”, unions connected with the Tamil film industry said the boycott of Tamils would be a lesson to Colombo. IIFA festival should not be held in Colombo, the statement issued by South Indian Film Chamber, Tamil Cinema Producers Association, South Indian Film Artistes Association, Film Employees Federation of South India, Tamil Nadu Film Directors Union, Tamil Nadu Film Distributors Federation, Tamil Nadu Cinema Theatre Owners Association, Small Screen Artistes Union and South Indian Film Journalists Union demanded. To begin with, 50 rickshaws would be launched for players to go from point to point in the sprawling 63.5 hectare Games village, which has 34 towers with 1,168 flats. A vacation Bench comprising Justices GS Singhvi and CK Prasad said the petition would be listed for hearing only in normal course as there was no urgency in the matter. Marandi, the first CM of Jharkhand, has accused the JMM chief of misusing a special provision under Article 164 (4) of the Constitution that enables an unelected person to occupy the top post subject to the condition that he/she is elected to the Assembly within six months.